Here's a look at the best laptop deals that are currently going on Amazon Great Indian Festival Sale day 3. 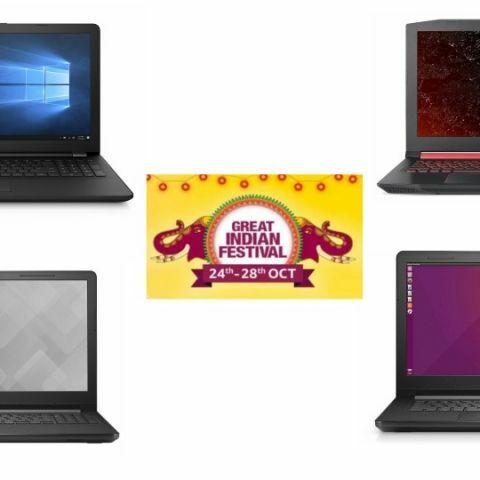 Amazon Great Indian Festival Sale kicked off on October 24 and going to run till October 28. We have handpicked the best deals on laptops that are live on Amazon right now. Interested buyers can also buy laptops on no-cost EMI along with a benefit of getting 10% additional discount on using CITI or ICICI Bank cards. The Lenovo Ideapad 330 is powered by an Intel Core i3 7th Gen processor. The laptop packs 4GB DDR4 RAM and 1TB hard drive. It has a 14-inch FHD anti-glare display that offers a resolution of 1920 x 1080 pixels. The laptop is available on Amazon with a flat 34% off on its MRP. View deal here. The HP 15 is powered by an Intel Core i3 7th Gen processor and has a 15.6-inch WLED display that comes with a resolution of 1366 x 768 pixels. The laptop is priced at Rs 30,990 during this sale period. One can also get an instant 10% additional discount on this purchase via CITI and ICICI bank cards. View deal here. The Dell Vostro 3478 is powered by the latest 8th Gen Intel Core i3 processor. The laptop comes with a 14-inch HD display with a resolution of 1366 x 768 pixels. The machine is pre-installed with Windows 10. View deal here. The Acer Nitro is a gaming laptop, which is powered by the latest 8th Gen Intel Core i7 processor. It has an FHD display that offers a resolution of 1920 x 1080 pixels. Coming to the graphics card, the laptop is equipped with an 8GB Nvidia GeForce GTX 1050 video card. The laptop has one 2.0 USB port and one USB 3.0 port as well. Gamers can grab this laptop for Rs 67,990, down from its MRP of Rs 92,199. View deal here. The HP 15 AMD is a basic entry level laptop that is powered by an AMD dual-core processor. It has a 15.6-inch HD display that offers a resolution of 1366 x 768 pixels. The machine comes with pre-installed Windows 10 so that you do not need to worry about purchasing one separately. At the sale, it is available for Rs 19,900 along with an option to get an extra 10% discount on using CITI or ICICI Bank debit or credit card. View deal here. The Dell Inspiron 3565 is also an entry-level laptop by Dell. the machine is equipped with AMD-9000 processor, which is clocked at 1.80GHz. The laptop has an HD display that offers a resolution of 1366 x 768 pixels. Buyers need to keep one thing in mind before purchasing that this laptop does not installed with Windows 10, which means you have to buy OS on your own. View deal here. If you can go a little over your budget of Rs 20,000 then the Lenovo Ideapad 320 is a much-upgraded machine than the one I have mentioned above. It is powered by an Intel Core i3 6th Gen processor, which is paired with 4GB DDR4 RAM and 1TB hard drive. You will also get pre-installed Windows 10 on your laptop. View deal here.